One of five journals with language games embedded. "Lorraine has raised the bar for inventiveness." offer a unique blend of fiction (Alice's travels in Indonesia and Japan) and nonfiction (cultural points and language games). Japanese teacher Nathan Lane of Education Services Australia created worksheets, lesson plans, and even some games around the three Alice in Japan journals. Colleen Lee-Hayes, Japanese teacher, used them in an online "trip" to Japan lesson: "I ask the students to go through each of the journals and read, view, listen and take the embedded language quizzes. They then send me an email commenting on what the most interesting thing they saw was, and where they would like to go that Alice went. It’s a great resource and also introduces them to an episodic story that they can experience on their own time!" are free to view online; Episode 6: The Last Gas Station is available for purchase. Episode 6: The Last Gas Station won a Robert Coover Award honorable mention at Electronic Literature Organization 2016! On the new narrative approach for Episode 6. I wrote several stories for this Peabody award-winning 1990s science radio program, including "The 17-Year Drum Corps," about an invasion of periodical cicadas. Having grown up on TV, I had to wrap my brain around "audio" as a medium. The second script was a LOT easier than the first. In Escape from Antcatraz, you play an ant trapped in a nest and must find your way out, chamber by chamber. In Safari!, you play one of six animals and must survive an adventure based on the type of animal you are—predator or prey? Big or small? In Quest for the Pole, you're on a polar survival adventure modeled after the infamous Franklin Arctic Expedition. The Balloonatics is a goofy global hot air balloon trip for young children. My interactive, digital journals appeared on a social media site for tweens. 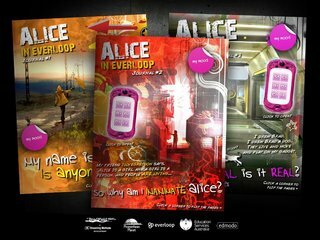 I directed "ALICE ON EVERLOOP" a presence for the character and her virtual friend Brad on a social media site for tweens. I adopted the voice of Alice and engaged directly with her young audience and wrote interactive journals, narratives, mini-games, and other content for her Loop (like a personal page). The platform folded, but I now know a whole lot to SHARE WITH YOU as a consultant or content creator. The gadget (on the left) floats above the journal pages and serves as a culture and language reference tool. I conceived and crafted a successful proposal for Education Services Australia (ESA) to create ALICE TRAVEL JOURNALS to teach Indonesian and Japanese languages and culture. managed the project, the creative technologist, and freelancers. The first five Inanimate Alice episodes were created on a very low budget and kept simple and short as a result, with very linear narratives. I wondered: What would an episode look like with a deeper and more complex story and characters, an expanded creative team, and a more robust tech platform? When I joined as narrative designer for EPISODE 6: THE LAST GAS STATION, my aim was to bring Alice into the commercial mainstream and to introduce far more player agency (choice-based consequences). First, I analyzed and synthesized the entire Alice story world (episodes, journals, strategy, educational outreach, marketing avenues) and crafted a dynamic and flexible design document, with an eye toward building it into a story bible for the brand as a whole. Then, I shaped and mapped the story world with an emphasis on audience-forward design and greater character depth. The final challenge was to build up and deepen the storytelling strengths by adding more intense emotional arcs to the structure and layers of meaning to dialogue, character behavior, and interactives. With a switch to Unity 3D, a new choice became: do you "play as Alice" (see the world through her eyes) or play as a "friend of Alice"—going along on her adventure while making choices and taking actions that she might or might not like? Alice is a remote and mysterious girl (we never see her face). She grew up traveling the world as an only child, constantly leaving new friends behind. She thinks she wants to be independent and yet inwardly yearns for a trusted, lasting friend that she won't EVER lose. As a potential friend of Alice, can you earn her trust and respect through the choices you make? And keep it? The more you know and understand Alice, the more she opens up to you. If you fall out of favor, she clams up and just might leave you behind (ouch!). This narrative approach would keep Alice's personality and values strong (and consistent) and make the relationship between Alice and player dynamic throughout the 10 planned episodes. In short, the friendship would keep changing and the player would keep unearthing insights into the mysterious Alice, but Alice herself would always be Alice. Interactive storytelling and narrative design are what I know, what I can do, and where I best shine. That's the messy, complex sandbox that I most love playing in. My career dovetails with a very rare place and time when it was possible to explore and experiment with this brand new medium freely. I wrote my first digital narrative and video game scripts in the 1980s for Scholastic and then moved onto CD-Roms in the 1990s. My appetite for the form has only grown. I am a writer-game designer, melded. 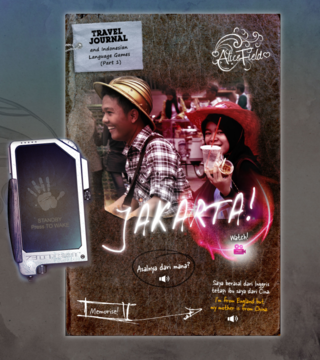 My five interactive travel and language learning journals with 22 embedded games.